The Kyocera TASKalfa 307ci Color Multifunction Printer was designed for those days when you’re buried in work that you don’t think you’ll ever get done. This MFP will help to streamline the processes that you need to help make your jobs quicker and easier. There are always things coming up that you need to get done in a moments notice. Having a printer that can keep up with that is essential for every business. The Kyocera TASKalfa 307ci MFP produces up to 32 pages per minute, whether you’re printing color or black-and-white documents. This copier has a compact tablet-like touch screen to make it very easy to operate. The touch screen works exactly like your phone would, this means any one can operate it. Kyocera TASKalfa 307ci MFP. It can handle your copy, print, scan and fax needs. The most important asset in your business should be your business files and documents. The TASKalfa 307ci has all the tools that you need to keep your business running smoothly and helps you to keep files safe and transfer or copy them. 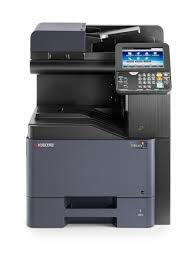 Call us today and we’ll help you with your purchase of the Kyocera TASKalfa 307ci Color Multifunction Printer!